Having worked in the child psychiatry ward at a local hospital in the past, I have seen my share of sexual abuse cases. For this reason, I sometimes like to keep to date with material that deals with this issue. 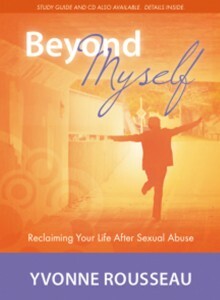 Beyond Myself is a little book that is specifically designed to help the victim of sexual abuse to see that there is a restoration process. It is also handy for therapists, family members and anyone in law enforcement that deals with sexual abuse cases. This book is written by a sexual abuse survivor who has twenty years of experience analyzing and researching the worldwide impact of sexual abuse and violence. Yvonne Rousseau is an advocate and has helped victims in the recovery process using the steps she highlights in this book. Her well-written book has helped me to better understand what a sexually abused person goes through from denial to flashbacks and the very difficult step of letting go of victimization. This book is not filled with explicit anecdotes of what abused people have gone through. Rather, it focuses on the steps toward healing and they are well explained, helping both the victim and any therapist understand why a person must go through each step to fully heal. In the last section when Rousseau explains the restoration process, she discloses a little about her personal journey and how her faith in Jesus Christ has helped her heal. It's clear that Rousseau knows what she is talking about. Her voice is sympathetic but firm in her resolve to see others fight to stop the hurtful cycle of abuse. Because of my work experience, both my husband and I have tried to equip our own children with the knowledge of what is appropriate and inappropriate behaviour of any adult (father, uncle, aunt, grandparent or friend) and what to do if anyone tries to touch them. This book only reinforced for me how important it is to teach our children these things. I have the highest respect for someone like Rousseau who has made it her life work to help individuals take on an active role in their personal recovery, as well as familial and societal recovery. I would easily pass this book to anyone I know that could benefit from it either as a victim or support person. In addition, any interested person can also obtain the Beyond Myself Study Guide and the Beyond Myself Music CD. For more information, please visit BeyondMyselfRecovery.com. Disclosure: Thanks to the author and Mediaguests for sending me this book for review. I was not compensated in any other way, nor told how to rate or review this product. This sounds like a very helpful for book for a victim or a victim's family seeking to recover from such a tragic event. Sounds like a great resource. isn't it sad that books like these even need to be written?